In previous posts, I’ve explained how cybercrime is big business, and the criminals behind the illegal activity run sophisticated online companies. Today, let’s begin talking about how to defend your company against them. We’ll start with the Federal Trade Commission (FTC), the de facto data security and privacy enforcement authority in the United States. The 1914 Federal Trade Commission Act did away with the concept of “caveat emptor” (or, “buyer beware”), in favor of a more consumer-friendly regime that requires sellers to operate at a higher standard. Don’t let the simplicity of this law overshadow its broad power. It has been reimagined for our digital age to be applicable to the practice of cybersecurity. And, if your website says you encrypt all personally identifiable information, you’d better do that. In its action against Twitter, Inc., the FTC alleged that the company gave almost all of its employees administrative control over Twitter’s system. 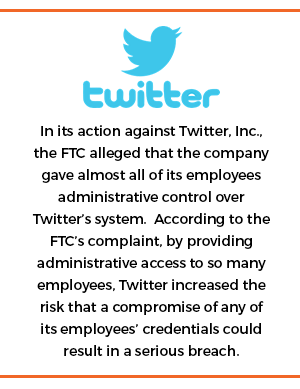 According to the FTC’s complaint, by providing administrative access to so many employees, Twitter increased the risk that a compromise of any of its employees’ credentials could result in a serious breach. In the complaints against Petco Animal Supplies, Inc., the FTC alleged that they failed to implement policies and procedures to safeguard consumers’ information. And, in its complaint against GMR Transcription, the agency alleged that GMR’s data security practices were inadequate and resulted in transcriptions of audio files provided by GMR’s customers being indexed by a major search engine and made publicly available to anyone using the search engine. Next week, we’ll dive into why the FTC says you need to practice reasonable cybersecurity and what that means to you.